Last week we found a dead baby bird on our driveway. Actually, my partner found it and then loudly announced to everyone, “Woah a dead bird! Come see!” My instinct was to protect the littler two of my three kids. “Uhhhh well…guys do you understand what you’re about to see? The bird isn’t alive anymore. It can’t fly or play. It’s body is on the ground but it isn’t using its body anymore. 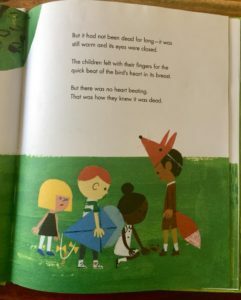 It’s body is dead.” My protective instinct was totally off, because the kids all DEFINITELY wanted to see, so we huddled in close and circled around the dead bird. We stood for a moment, examining it. “Should we bury it?”, I asked. “I’ll get the shovel.”, my middle kid offered. A moment later we were digging a grave in our backyard, bird body placed gently on the shovel, waiting to be moved to its final resting place. We covered the grave and stood for a moment, silent. “I think it needs a stone to mark it.”, said my eldest. 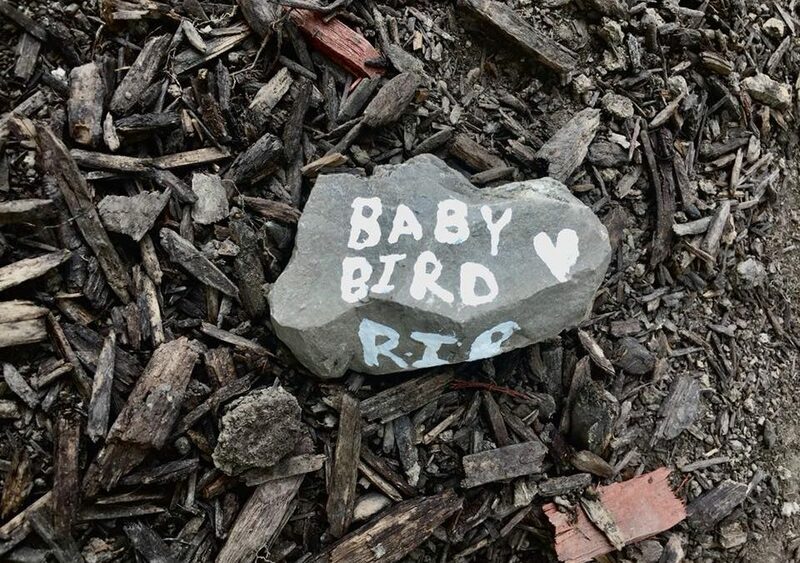 So we found a good sturdy stone and wrote the words, “BABY BIRD RIP” on it. We hadn’t thought much about it for the next couple of days, but during that time, I placed a big book order online. 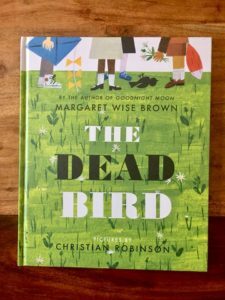 I ordered a bunch of beautiful books but the one that caught my eye most was “The Dead Bird” by the beloved Margaret Wise Brown. A simple concept: a group of children find a dead bird, and bury it. I bought it. The order arrived today and I walked over to the post office to pick it up. Next to it is a Tim Hortons so we grabbed a snack, sat in the patio and I eagerly tore open the box to pull out the book and see how the kids responded to it. We read it right there on the patio. Oh my goodness what a beautiful book. With her gorgeous style, so peaceful, non-judgemental, and simplistic. Enormously emotional concepts covered and examined with such grace and ease. We read the book once and then again, with new observations each time through. 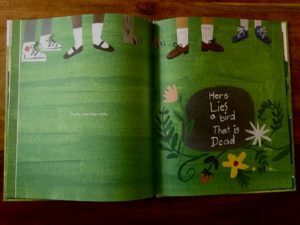 We noticed the ways our grieving process and our attempts at showing our dead bird respect were both so much the same and different from the children in the book. We discussed the fact that all over the world, people grieve and mourn and process loss and death in different ways and that every way is okay. We finished up our snack, packed up and left to walk home. But before I could leave, an elderly man who had been listening in walked up to me, put his hand on my shoulder and said, “I wish I’d had a mum like you”. I teared up and gave him a hug. “Oh you’re just seeing one good moment, not all of the moments”, I shrugged. He replied, “I’m seeing three children who can talk about death. I still can’t.” We went our separate ways, but I couldn’t stop thinking about the man. I still can’t. I think I take for granted how naturally it comes to us as a family to talk about complex, unsettling issues. We discuss racism, sexism, bigotry and prejudice of all sorts. We talk about illness, death and grief. We talk about refugees and border walls and wars and loss. We talk about mental illness, addictions, trauma, and heartbreak. We talk about these things because we live them every day, or if we don’t, someone else does, and they deserve to be understood. They deserve to have someone in their corner. Death needn’t be scary. Death needn’t be a secret topic that we shield and protect our children from. It’s lived and seen and felt every day. If not by us then by others. And who are we if not someone else’s other? We all deserve to be understood, and I believe in raising our kids to not be protected from life. The good, the bad, the scary, the hard, the heartbreaking. I’m grateful for those difficult moments. Because with them come the moments like the man I met today – and the healing that comes when we allow ourselves to process and feel, freely. Danielle writes regularly in her Facebook group if you would like to read more of her work.